Hello there! Happy Sunday... well, what's left of it. I'm actually going to "hit the hay" as they say a bit early tonight -- as soon as I finish writing this lil' note to you! 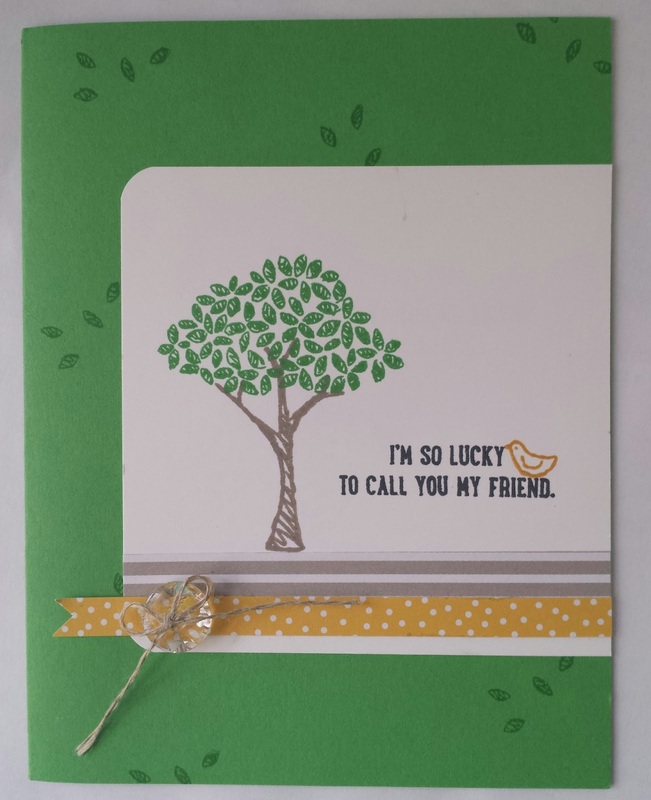 I'm sharing another card I made using the Sprinkles of Life Stamp set. 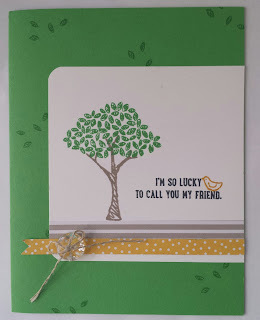 I truly adore this stamp set and the coordinating tree builder punch. I couldn't be happier that it is this year's Ronald MacDonald Charity stamp set as I suspect I will sell A LOT of them in the next 12 months. It's just so stinking cute -- and incredibly versatile. Today I used the new In Color Cucumber Crush, which I must say was my least favorite In Color for this year, but I really adore how this one came out. It's all pretty simple -- all the stamps came from the Sprinkle of Life stamp set and the two small pieces of patterned paper came from the Cherry on Top 6x6 paper stack. I'll have to showcase that paper on another card because it is really bright and bold -- even though you wouldn't get that from this card! 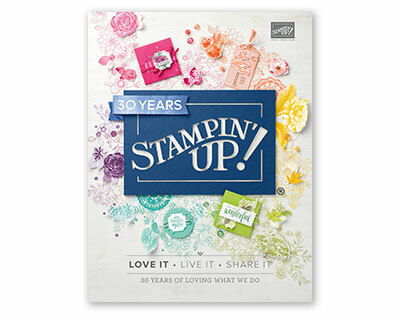 So have you got your new Stampin' Up catalog yet? What do you think? Is your wish list as big as mine? Perhaps you should consider join the Shore Stamper team then! Right now you can join for just $99 plus tax and YOU get to pick $125 worth of merchandise PLUS two free extra stamps of your choice... yup, all for just $99! Great deal, right? What's that you say? You don't have a catalog? 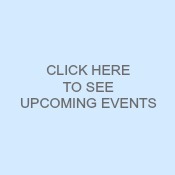 Well e-mail me at jen pitta at comcast dot net and I'll get one out to you pronto! Okay... that's all for me tonight... I'm super tired and a little sore (I think I pulled a stomach muscle at the gym the other day... I know, that just sounds weird, but I was working on my core! It is bathing suit weather, you know! Anyway, off to bed with me... enjoy your evening and come back soon! So... Have you seen it?